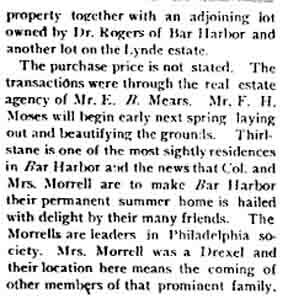 In 1898, furnaces were installed. 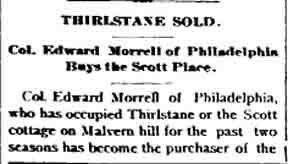 In 1926, Thirlstane was purchased by William Pierson Hamilton, a great-grandson of Alexander Hamilton and son-in-law of J. P. Morgan. The cottage burned during the 1947 fire, but remnants can still be seen from various points in downtown Bar Harbor and from higher places in the area.